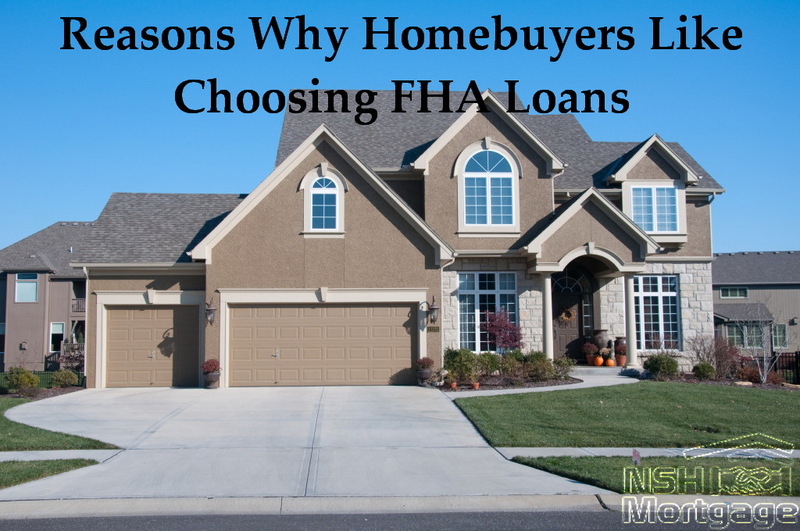 Reasons First Time Homebuyers Choose FHA Home Loans. NSH Mortgage has the wisdom and tools to help you with the financial benefits a FHA Loan provides you. FHA Home Loans are mortgages insured by the Federal Housing Administration that feature lower underwriting standards and rates than conventional loans. Along with lower minimum down payments of 3.5%. Additionally, FHA borrowers are required to pay for mortgage insurance (MIP) to protect the lender if a default. Home buyers today do not often buy homes with 20% down. Low and no down payment mortgages remain popular with first time buyers and repeat buyers alike. One of the most popular low down payment mortgage program is the FHA loan through the Federal Housing Administration. Nearly one in five U.S. buyers uses a FHA loan to finance a home purchase. The program’s popularity is because buyers can make down payments of just 3.5 percent through the FHA. Also, there are other reasons why FHA loans are in high demand besides loose underwriting standards, FHA mortgage rates are lower than comparable conventional rates; and FHA loans can be assumed by a home’s subsequent buyer. The Federal Housing Administration (FHA) was established in 1934, which in U.S. history, was a period of heavy renting. The country was emerging from The Great Depression. Just four in ten households owned their homes. At the time, the mortgage terms offered by lenders were onerous. To get a loan meant to make a 50% down payment to agree to a loan term of five years or fewer and, to make a large balloon payment to the bank after the mortgage’s first few years. Few U.S. consumers could meet the terms of a 1930s mortgage. Meanwhile, the government wished to increase the rates of homeownership nationwide. With more homeowners, the government reasoned, neighborhoods would stabilize and the U.S. economy would get back on track. Out of this the FHA and its flagship mortgage programs were created. The main feature of the FHA backed mortgage was its Mortgage Insurance Premium (MIP) program, a self sufficient insurance fund through which the FHA could insure the nation’s lenders against bad loans. In order for a bank to get the FHA’s insurance on its loans, it was required to verify that its loans met the FHA’s minimum qualification standards. These rules came to be known as the FHA mortgage guidelines. In time, the FHA MIP system gave banks confidence to make better loans with better terms for hopeful U.S. home buyers. In due time the down payment requirements for a home loan will be dropped and the five year loan terms were replaced with longer terms of 15 and to 30 years and as such mortgage rates have dropped. The FHA is the largest insurer of mortgages in the world. In today’s expanding economy, U.S. home buyers have a broad selection of mortgage loans from which they can choose from. As examples, there are conventional loans available such as the Rural Housing Loans available through the USDA and, 100% loans available through the Department of Veterans Affairs and its VA loan. Even jumbo mortgages and private loans have made a comeback of late. Although, loans supported by the Federal Housing Administration remain in very high demand. The FHA loan’s combination of low rates, low down payment, and flexible lending guidelines have made it one of most common loan choices for home buyers today. There are benefits to choosing a FHA loan. Here are some of the biggest. It may seem odd to call FHA mortgage insurance as an improvement since it does not come for free however, FHA MIP is what makes the FHA program possible. Without the MIP, FHA approved lenders would have little reason to make FHA insured loans. The good news is that, as a homeowner or homebuyer, your FHA MIP rates have dropped. Today’s FHA MIP costs are now as much as 50 basis points (0.50%) lower per year than they were in 2014. Also, you have ways to reduce what you will owe in FHA MIP annually including using a 15 year mortgage term for your loan or making a downpayment of at least five percent. Or as many homeowners are doing in today’s market, you can refinance out of FHA MIP. For today’s home buyers, there are only a few mortgage options which allow for down payments of five percent or less. The FHA is one of them and, with a FHA mortgage you can make a down payment as small as 3.5%. This benefits home buyers who do not have a lot of money saved up for down payment and, home buyers who would rather save money for moving costs, emergency funds, or other needs. The FHA is aggressive with respect to gifts for down payment. Very few loan programs will allow your entire down payment for a home to come from a gift. Through the FHA, your entire 3.5% down payment can be a gift from parents or another relative, an employer, an approved charitable group, or a government homebuyer program. If you are using a down payment gift, though, you will need to follow the process. Not every home buyer will have a valid social security number and according to the FHA that is alright. FHA guidelines permits loans to employees of the World Bank and foreign embassies. The FHA will also insure loans for non-permanent resident. FHA loans can be funded by any FHA approved lender. This includes mortgage lender, savings and loans institutions, and credit unions. The marketplace for FHA loans is giant, which creates competitive pressure among lenders to offer low FHA rates and low FHA fees. It pays to shop around on a FHA loan. Furthermore, because different banks use different methods to underwrite, your FHA loan can be declined by Bank A but approved by Bank B. If you meet the rules of the FHA, you can apply until your loan gets approved! With the FHA, you can get a mortgage of almost any type. The agency is best known for its traditional 30 year fixed rate mortgage, but the FHA also offers a 15 year fixed rate loan as well as a series of adjustable rate mortgages (ARMs). In addition, the FHA insures purchase and improvement loans for when you want to buy a home that needs repairs. These 203k construction loans are for when you want to buy a home that was newly built and energy efficiency loans. Also, for when you want to finance the costs of energy efficiency improvements into your loan. In addition to this the FHA also supplies a full line of FHA refinance products. FHA home buyers are able to purchase any home type in any U.S. neighborhood; whether in the 50 United States, the District of Columbia, or any U.S. territory. The FHA will insure single family detached homes, two unit homes, three unit homes, four unit homes, condominiums, mobile homes and manufactured homes. Out of all the possible and available loan types in today’s U.S. market, FHA loans are among the most forgiving with respect to credit standards. The FHA does not require perfect credit and even instructs its approved lenders to look beyond isolated credit events and to consider a borrower’s complete credit history regardless of credit score. Even borrowers with a recent foreclosure, short sale, deed in lieu or bankruptcy can be eligible for FHA financing. Mandatory three year waiting periods do not exist with a FHA loan. A loan limit is the maximum allowable loan size for an area and as another FHA benefit, FHA loan limits can be extended as conventional loan limits are. For two unit, three unit, and four unit homes, FHA loan limits are even higher ranging up to $1,202,925. A little known FHA benefit is that the agency will allow a home buyer to assume the existing FHA mortgage on home being purchased. The buyer must still qualify for the mortgage with its existing terms but, in a rising mortgage rate environment it can be attractive to assume a home seller’s loan. Five years from now, for example, a buyer of a FHA insured home can also inherit a seller’s sub four percent mortgage rate. By way of its 203k program, the FHA offers construction loans to homebuyers planning upgrades to a new home and homeowners planning to make repairs to home already owned. Through the FHA 203k loan, projects including new roofing, structural additions, and complete home teardowns. The 203k loan can be applied to homes in need of minor repairs as well as fixer uppers. Another advantage for FHA backed homeowners is access to the FHA Streamline Refinance. The FHA Streamline Refinance is an exclusive FHA program which offers homeowners one of the simplest path to a refinance. Through the FHA Streamline Refinance, there are no credit score checks, no income verifications, and home appraisals are waived completely. In addition, through the FHA Streamline Refinance homeowners with a mortgage pre-dating June 2009 can get access to reduced FHA mortgage insurance rates. USDA Mortgages Versus FHA: Which Is Better For First Time Home Buyers?